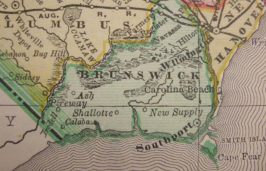 This is the third in a series of stories examining the origins and history of notable and unusual place names along the North Carolina coast. 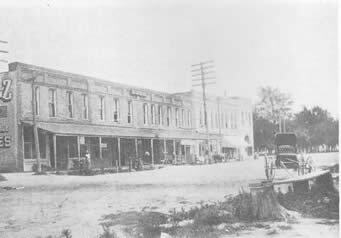 PENDER COUNTY – There’s little mystery to where Pender County got its name. Maybe because its history is relatively new, compared to other North Carolina counties. 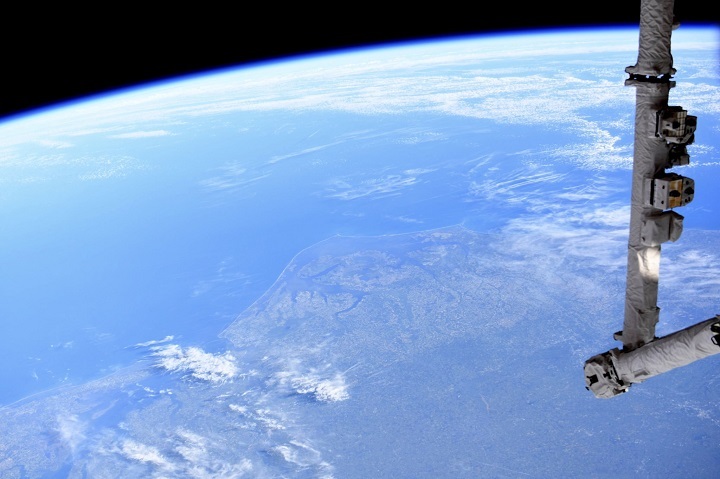 It separated from New Hanover in 1875. Of the state’s 100 counties, only a handful were founded later. On the other hand, like many other coastal spaces, it was inhabited and explored for much longer than that. The state’s oldest home is on Pender’s coast. It was also the site of the first North Carolina battle in the American Revolution. When it came time to make things official, though, they turned to William Dorsey Pender, a West Point graduate and Confederate general who died at age 29 in 1863 in Staunton, Virginia, following a leg amputation related to injuries sustained during the Battle of Gettysburg. You can find his likeness on a monument near the Pender County Courthouse in downtown Burgaw. It’s probably a good place to continue our look at names up and down the coast, with this third in the series of stories, speculation and historical theories about local names. The county seat was named for the Burgaw Creek and for many years, it’s been a local legend that the name had Native American origins. “It was kind of a good-natured joke,” said Mike Taylor, director of the Pender County Library. “That it came from a name that meant mud hole.” It was an idea that took hold, and can still be found in some documents and books about the area. Taylor, however, researched the topic and believes the name actually has German origins. When the area was an upland bog, it was known as the Big Savannah that bloomed with wildflowers much of the year. Botanist B.W. Wells included a chapter about it in his 1932 book, “The Natural Gardens of North Carolina.” Early settlers likely came from a town called Burgaw, or Burgau – which means a fortified place on a wet meadow, he said. There are also a number of Burgaw castles, or ‘water castles,’ in Germany and Austria. One of the oldest homes in the state is at Sloop Point, said Jeanette Jones, president of the Pender County Historical Society. The home, constructed around 1726, is similar to Quaker-style homes found in the Caribbean and was part of a land grant of about 1,000 acres extended to John Baptista Ashe. Beverly Tetterton, a local history expert, said one unusual feature of the house is its cooling system. Near the rear of the house is a hole in the floor that allows cool air from underneath to ventilate a bedroom. At the front of the house, an opening in the porch ceiling allows air to rise to a closet on the second floor and into the front bedrooms. A renovation of the plantation was completed in 1989, which kept the colonial wood flooring, paneling, doors and windows. A sloop, by the way, is a fore-and-aft rigged boat with one mast and a single jib. And they were a common site on the local waterways, thanks in part to an early shipyard and port. It’s believed that the plantation was where the sloops made landfall. The plantation also operated an early salt works, making the much-needed commodity from the local seawater. Maps from the mid-to-late 1700s mention New Topsail Inlet and Topsail Sound, making it a name with a long history. Local legend say pirates would hide in the area, or perhaps sail through the waterways hoping to ambush unsuspecting victims. It became a habit to watch for the top sails of the pirate ships, Taylor said. “There were a couple of areas with the Topsail name.” Beaufort Inlet in Carteret County, for example, was known as Topsail Inlet a few centuries ago, and then Old Topsail Inlet before it took its current moniker. 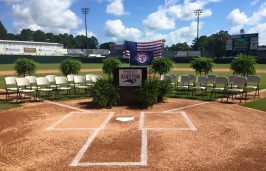 For the most part, though, the name stuck in parts of Pender and Onslow counties. 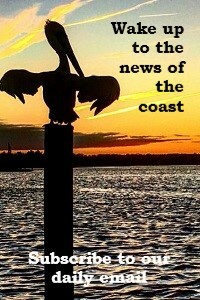 Much of the reason is because when beach development came to the area after World War II, Topsail was the name chosen. Before that, according to local histories, the island was called Sears Landing (which is now the name of a restaurant) and Long Island. Topsail Island spans 26 miles, so it is extensive but by no means the longest of the state’s barrier islands. 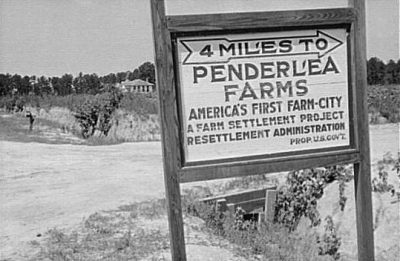 This community in northern Pender County was the first of 152 New Deal homestead projects developed in 1934 under President Franklin Roosevelt. It was designed as a farm city for down-on-their-luck agricultural workers. Perhaps the name, a combination of the county and a word that refers to arable land, helped lure families here. 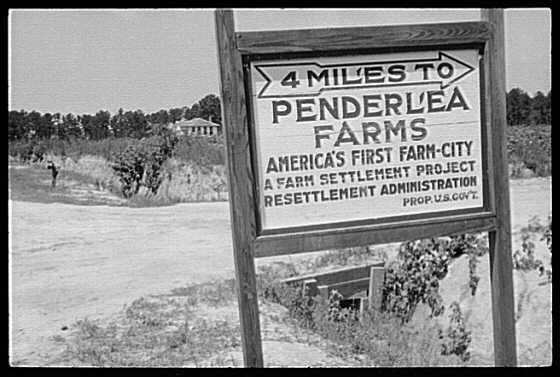 Hugh MacRae, who also developed other farm communities in Southeastern North Carolina including Castle Hayne in New Hanover County, was instrumental in designing Penderlea. He oversaw the community until it began to be operated under federal management. It was built in a horseshoe pattern, still evident today. Farms were 10-acre plots. The community also included a 23-acre school campus and buildings for social gatherings, potato storage, a cannery, grist mills, a general store and furniture factory. That’s according to the Penderlea Homestead Museum, which was listed on the National Register of Historic Places in 2013. One of the highlights of Penderlea was a visit from First Lady Eleanor Roosevelt in 1935. Today many homes, the large community center, and other structures associated with the project remain. There are dozens of Black Rivers in the United States and more in other countries around the world. And those are just the waterways named as such. There are more black water rivers, including the Northeast Cape Fear River, which also flows through Pender County. For the most part, these rivers are called this because the leaf matter, or tannins, stain the water dark, like tea. This particular Black River begins in Sampson County, and flows along the Bladen-Sampson county line and then along the Bladen-Pender line. The unique characteristics of the water lead to unique ecosystems. The Nature Conservancy has worked to protect the Black River in Pender County, which has many meanders, artesian springs and mature swamp forests. 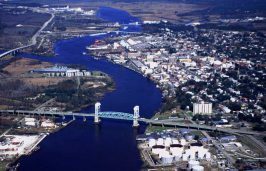 This includes the 2,700-acre Roan Island, a silt island located at the confluence of the Black and Cape Fear Rivers. Roan Island is accessible only by boat, and its open canopy forest includes trees that are thought to be more than 1,000 years in age, perhaps the oldest stand of trees east of the Rocky Mountains. There always seems to be more than one version of good stories. 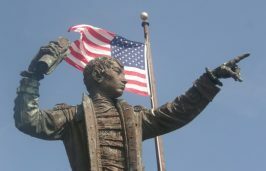 The accounts here come from interviews with local history buffs, as well as local history references. A few are listed below. Atkinson: This community was formed along the Atlantic and Yadkin Valley Railroad. For a time, it was named for W.H. Lewis, who owned the land on which the town was founded. Lewis, however, was instrumental in calling the town Atkinson, for an engineer who helped survey and complete roads in the area. Beattys Bridge: This road near Atkinson is named for a prosperous family that built an antebellum mansion that still stands at the bridge that crosses the Black River, Taylor said. The 1991 movie Rambling Rose, starring Robert Duvall and Laura Dern, was filmed at the home. Big Savannah: Both the Old Savannah and New Savannah roads in Burgaw reference the wet savanna that was destroyed in the 1950s for development and farmland. The site was studied extensively in the 1920s and was said to be prolific with wildflowers, Taylor said. It contained a remarkable number of sedges and carnivorous plants. Blueberry Road: Blueberries grow particularly well in southeastern North Carolina. And Pender County has been home to the North Carolina Blueberry Festival for 14 years. This road in Currie, as well as Berry Patch Road in Hampstead, reflect this history. Canetuck: This community, sometimes also spelled Caintuck or Kaintuck was known for rich farmlands. The best story about the name is that two hunters in the area had such a successful day that they found themselves with more game than they could carry. So, they decided to ‘tuck’ it into the ‘cane’ grass that grew there. Croom’s Bridge: Or, as it’s listed on maps, Croomsbridge. Jones said she used to live on this road, so the story is one that interested her. The Croom family is one with many ties to the area and believed to be among the early settlers here, dating to the late 1700s. 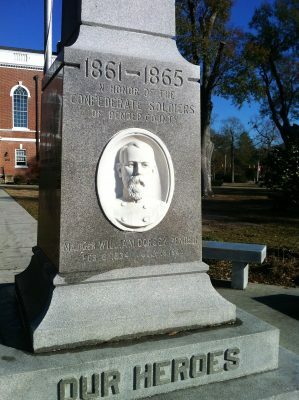 Currie: This town is named for John H. Currie, director of the Cape Fear and Yadkin Valley Railroad. 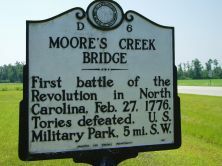 Prior to its establishment in 1888, it was the site of the Battle of Moore’s Creek Bridge during the Revolution. Dirty Hole: At least one local history text features an old photo of a community known then by this dusty name. It’s located at what is now the intersection of Fennel Town and Stone House roads. Foy Creek: This waterway in southern Pender flows into Topsail Sound and is named for the Foy family, who owned and operated Poplar Grove Plantation for at least five generations. The creek forms the headwaters of Futch Creek, and there is a Futch Creek Road that runs parallel. Fremont Street: Burgaw’s street plan was designed with a large central square by surveyors with the Wilmington and Weldon Rail Road in 1878, Taylor said. And every surname of each railroad president is represented. This one is named for Col. Sewell L. Fremont, superintendent of the railroad during the Civil War. Hampstead: Although there is an entertaining story about George Washington stopping at this community and feasting on ham, the origins of this name are likely much more mundane. The London neighborhood of the same name was probably the inspiration. 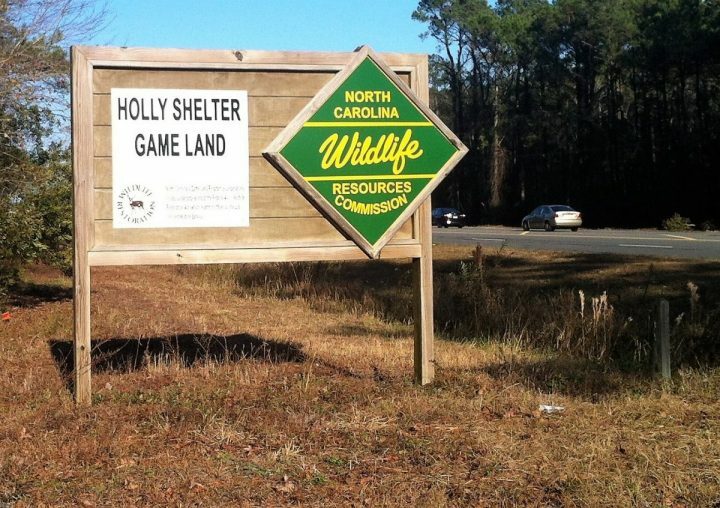 Holly Shelter: This tract of land that consists of almost 50,000 acres has served as a wildlife refuge and game land is said to take its name from the Holly Family of Pender County. The state-owned Holly Shelter Game Land dates back to 1939 and is one of the largest, least-disturbed longleaf pine ecosystems in North Carolina. Lane’s Ferry: The story goes that there was a ferry that operated across the Northeast Cape Fear River site near Rocky Point. It’s also been a store and gathering place since 1881. It’s now the location of Lane’s Ferry Dock & Grill, in a home and general store built in 1932. Marlboro: At one point, there was a stop on the Wilmington and Weldon Railroad that went by this name. Despite the tobacco-heavy connotations, it’s likely a reference to the marlstone found in the area, Taylor said. Mary Slocum Road: Mary Slocumb is the woman who rode 31 miles through Pender County on horseback during the Revolutionary War, after getting a premonition of her husband’s death. Although her husband didn’t die, she did tend to wounded soldiers that day. This road, minus the ‘b’ in its spelling, is in Watha. Porters Lane: This road in Rocky Point refers to Dr. Elisha Porter and his 1840s-era, two-story plantation home at the end of the road. Rocky Point: Although you wouldn’t know it now, this was once a truly rocky point, Taylor said. “There was a large marl outcropping that was after during the Civil War.” In fact, it was mined 1879-80 to build what is still known as “The Rocks” closing the “New Inlet” between Fort Fisher, or Federal Point, and Smith Island, also known as Bald Head. Satchwell: In addition to railroad executives, streets in Burgaw were also named for prominent people, Taylor said. East and West Hayes streets, for example were named for the 19th U.S. president, Rutherford B. Hayes. Satchwell Street is in honor of Dr. Solomon Sampson Satchwell, who was instrumental in forming the State Board of Health and the North Carolina Medical Society. Shelter Neck: This community is closely associated with state’s Unitarian Universalists, a church with no creed other than a shared desire for spiritual growth, which operated a school here beginning in 1902 for children who otherwise lacked access to education. Stag Park: Although this road sounds like it could be from any modern development, it actually has a long history. It’s said that in 1663, explorers from Barbados surveyed the area from a bluff and saw a large herd of deer, Jones said. There’s an historical marker on the road, as well. St. Helena: This community is another of Hugh MacRae’s settlements. This one, which consisted of mostly Italian immigrants, was named for the mother of the Roman emperor, Constantine the Great. Van Eden Road: This road takes its name from founder Frederick Van Eeden, a Dutch physician and botanist, who created a settlement here from land purchased in 1909. Watha: On early maps, this area was listed as Welsh Tract because of its early settlers. It was also called South Washington, before it moved to the current location with the construction of the railroad. The station there was called Hiawatha, from which the town took its name. White Stocking: There are a couple of theories about how this predominately black community got its name. Although some accounts say residents hung white stockings from trees, many think it relates to the stocking-shaped road that was covered in white sand. Allison Ballard is an award-winning writer and journalist who covers topics such as food, film, science and the environment for a variety of local and regional publications. Since early days as high-school reporter, she’s gained experience in much larger newsrooms and through graduate programs at the University of Cape Town and the University of North Carolina Wilmington. Allison loves to travel, but always returns home to the North Carolina coast.